There was an old belief that the Isle of Man floated freely around the Irish Sea. In the 17th century, a Hungarian traveller wrote 'Monia is the most celebrated of the small islands around the English coast because it has no foundation'. This untethered island wasn't somewhere I'd visited before, or even glimpsed from the English coast. On a map it looks near to where I live, but I knew it was far away. The ferry sails towards Man through a field of wind turbines. Awkward, gangly, some shy, others stubborn – at sea they look like things grown rather than made. And they seemed to be churning the mist. There is a story about the island being hidden in a magical mist. An ember from a sailor's pipe fell on the land and undid the spell, but if all the fires on the island were extinguished at once the mist would return. All I could see ahead of me was sea mist and sky, merging in that almost colour your eyes reach for but can't quite meet. Then the horizon wrested itself from the water and the island was there. Whole at first; taken in with one glance. When I closed my eyes I could see the afterimage of its entirety long after it had stretched out into hills, cliffs, lighthouses and the long crescent of a Victorian promenade. Standing on the island I found I could see home. I saw Ireland, too, from the west side. I navigated the island using these other places as my compass points. 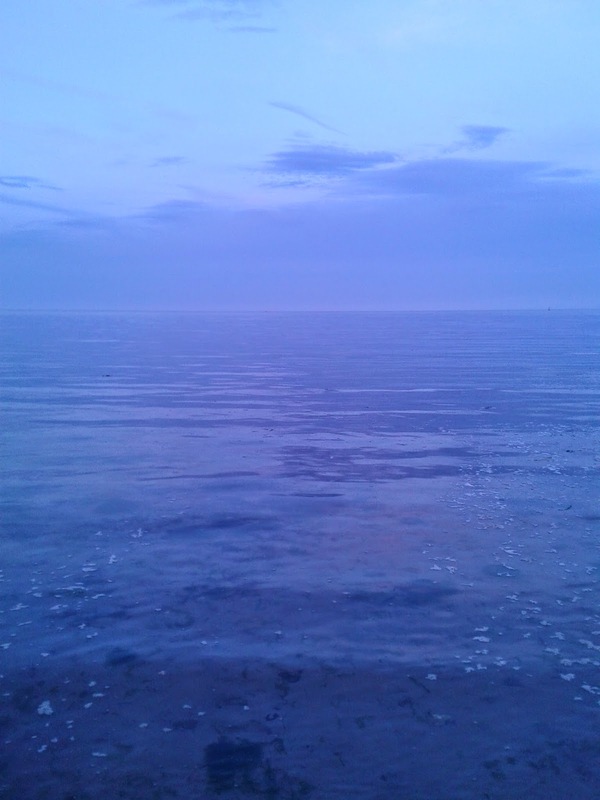 At dusk, I walked down a beach in the direction of home. When I slipped my shoes off the puckered sand was icy against my soles. I stood with my toes right at the very edge of the sea and couldn't resist going in. I have never seen so much blue. The water was painfully cold. When I stepped out the sand was warm. I watched my mind register this as the sand having heated up in the chilly twilight – insisting the landscape had changed and not me. I found that on Man it is easy to fall into the footprints of folklore. Wandering lanes of fishermen's cottages I saw cross cuirns – rowan sticks bound with wool – hanging over doorways for protection. On a cliff top walk, overwhelmed by the sheer drop and unsure of the path and whether I should proceed I found three white feathers in quick succession and a hare crossed my path. I kept walking and found bluebells. At home, their colour had already leaked away (I know it isn't possible, but remain convinced they stain the air just above them and that's why they fade). Here, they were swollen with blue, but walking through them could easily lead you over the edge. I walked and walked. Not the kind of walking that gives you space to think but the kind that allows you not to think. When sensing the space around you becomes all. On one path high above the sea, marked only by the way the grass gently held footsteps, I found a scrunched up crisp packet. I picked it up to carry on with me to a bin and saw the best before date was November 2000. It had either survived all that time on the cliff top, or been blown about the island for years and only just come to rest there. After a reading in a pub back at home a few days later, someone mentioned the crisp packet in my story 'Feather Girls'. I don't know why, but there are crisp packets in many of my stories. The 14 year old packet came home with me. As did a pocketful of stones, a dimpled stick, Victorian marbles that had belonged to a shopkeeper's grandfather, and an old book of Manx fairy tales that was inscribed with a previous owner's name and address. As it was just a few streets from the bookshop, I was able to find and stand outside the house where the book had once lived. I brought back other things I can't hold like the steam from a steam train caught between trees, a recorded voice in a museum saying 'I'll tell you a story that will keep you safe', and the shifting description of a Viking woman buried within castle grounds with glass beads and an iron rod. That this was the staff of a wise woman was a possibility given in one place I visited, but hidden in many others where it was a cooking spit instead. We make objects the holders of our stories, but the language to read them is so easily lost and they are filled with other people's stories in turn. Home had become strange after only a few days away. Every habitually unremarked movement rang out with 'I am at home.' But I've found I can close my eyes and the afterimage of the island remains.